#Office365Challenge – Be an Office Insider is an initiative of Microsoft to allow us to be part of their future. At SHARE a week ago I said to a friend that I want to become part of the solution. Not always complain about things I don’t like – but actually give feedback. I’ve come across Office Insider and will share my journey into understanding this better with you. Office 2016 is rolling out around the world, and we’re already hard at work on the next wave of updates. We’ve asked Office 365 Home, Personal, and University subscribers to help make the next Office even better by becoming an Office Insider. It’s easy to join, just install the Office Insider build and get early access to the new Office innovations. 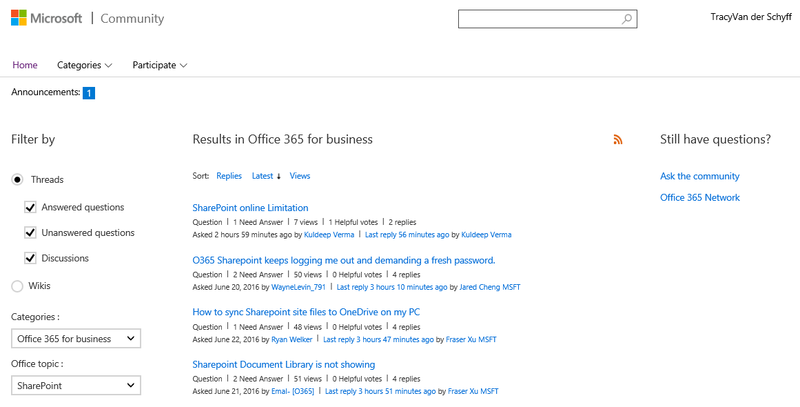 Tell us what you think, your feedback will make Office great for users worldwide. Office Insider is available on Windows (desktop and mobile), Mac and Android. Join Office Insider as a subscriber and get first access to the latest Office features and experiences. Be a part of the ongoing process to build and improve features and functionality in Office. Connect with people who are as interested in technology as you are and get support from the Office Insider community. I’ve started by looking at being part of the Community as I want to give feedback and become part of the future of Microsoft. Microsoft Community is a free community and discussion forum for asking and answering questions about using your Microsoft products. I’ve added filters to see specific threads / discussions going on. Hoping to start getting value and contributing to the community.